A lump in the neck...Cancers that begin in the head or neck usually spread to lymph nodes in the neck before they spread elsewhere. A lump in the neck that lasts more than two weeks should be seen by a doctor as soon as possible. Of course, not all lumps are cancer. But a lump (or lumps) in the neck can be the first sign of cancer of the mouth, throat, voicebox (larynx), thyroid gland, or of certain lymphomas or blood cancers. Such lumps are generally painless and continue to enlarge steadily. Change in the voice...Most cancers in the larynx cause some change in voice. Any hoarseness or other voice change lasting more than two weeks should alert you to see your physician. While most voice changes are not caused by cancer, you shouldn't take chances. If you are hoarse more than two weeks, see your doctor. A growth in the mouth...Most cancers of the mouth or tongue cause a sore or swelling that doesn't go away. These sores and swellings may be painless unless they become infected. Bleeding may occur, but often not until late in the disease. Swallowing problems...Cancer of the throat or oesophagus may make swallowing solid foods difficult. The food may "stick" at a certain point and then either go through to the stomach or come back up. If you have trouble almost every time you try to swallow something, you should see a doctor. When found early, most cancers in the head and neck can be cured with relatively little difficulty. Cure rates for these cancers could be greatly improved if people would seek medical advice as soon as possible. Cancer of the larynx (or voicebox) is a disease in which malignant cells are found in the tissues of the larynx. The larynx is a short passageway shaped like a triangle that is just below the pharynx in the neck. The pharynx is a hollow tube about 5 inches long that starts behind the nose and goes down to the neck to become part of the oesophagus, the tube that goes to the stomach. Air passes through the pharynx and then the larynx on the way to the windpipe (trachea) and into the lungs. Food passes through the pharynx on the way to the oesophagus. The larynx has a small piece of tissue over it, called the epiglottis, to keep food from going into it or the air passages. The larynx contains the vocal cords, which vibrate and make sound when air is directed against them. 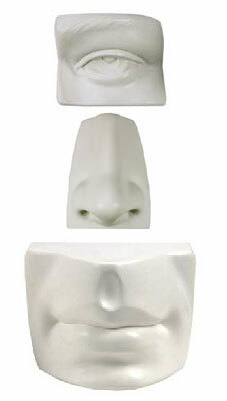 The sound echoes through the pharynx, mouth, and nose to make a person’s voice. The muscles in the pharynx, face, tongue, and lips help people form words with sounds to make them understandable. 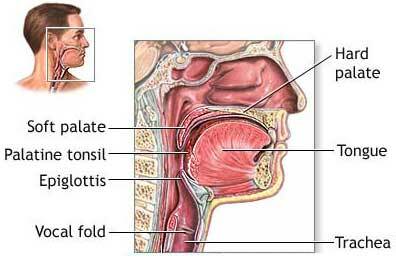 The subglottis (the tissue below the glottis). The subglottis connects to the trachea, which takes air to the lungs. If there are symptoms, a doctor will put a tube with a special light on the end of it down the patient’s throat to look at the larynx. 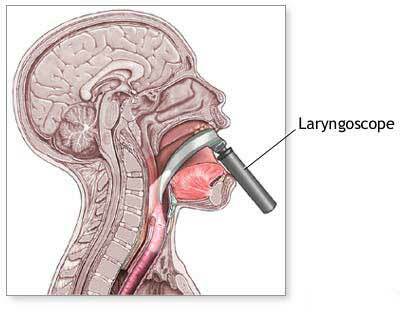 This is called laryngoscopy. If tissue that is not normal is found, the doctor will need to cut out a small piece and look at it under the microscope to see if there are any cancer cells. This is called a biopsy. The doctor will also feel the throat for lumps. The chance of recovery (prognosis) depends on where the cancer is in the larynx, whether the cancer is just in the larynx or has spread to other tissues (the stage), and the patient’s general state of health. The cancer has not spread outside of the larynx, but the vocal cords cannot move normally, or the cancer has spread to tissues next to the larynx. The cancer has spread to one lymph node on the same side of the neck as the cancer, and the lymph node measures no more than 3 centimetres (just over 1 inch). The cancer has spread to tissues around the larynx, such as the pharynx or the tissues in the neck. The lymph nodes in the area may or may not contain cancer. The cancer has spread to more than one lymph node on the same side of the neck as the cancer, to lymph nodes on one or both sides of the neck, or to any lymph node that measures more than 6 centimetres (over 2 inches). Radiation therapy uses high-energy x-rays to kill cancer cells and shrink tumours. Radiation may come from a machine outside the body (external radiation therapy) or from putting materials that produce radiation (radioisotopes) through thin plastic tubes in the area where the cancer cells are found (internal radiation therapy). External radiation to the thyroid or the pituitary gland may change the way the thyroid gland works. The doctor may wish to test the thyroid gland before and after therapy to make sure it is working properly. Giving drugs with the radiation therapy to make the cancer cells more sensitive to radiation (radiosensitization) is being tested in clinical trials. Radiation given in several small doses per day (hyperfractionated radiation therapy) is also being tested in clinical trials. If smoking is stopped before radiation therapy is started, there is a better chance of surviving longer. A cordectomy takes out only the vocal cord. A supraglottic laryngectomy takes out only the supraglottis. A partial or hemilaryngectomy removes only part of the larynx. A total laryngectomy removes the entire larynx. During this operation, a hole is made in the front of the neck to allow the patient to breathe. This is called a tracheostomy. If cancer has spread to lymph nodes, the lymph nodes will be removed (lymph node dissection). Laser surgery may be used for very early cancers of the larynx. During laser surgery, a narrow, intense beam of light is used to cut out the cancer. People with larynx cancer have a higher risk of getting other cancers in the head and neck area. Clinical trials of chemoprevention therapy are testing whether certain drugs can prevent second cancers from developing in the mouth, throat, windpipe, nose, or oesophagus (the tube that connects the throat to the stomach). Because the larynx helps with breathing and talking, a patient may need special help adjusting to the side effects of the cancer and its treatment. A patient may need to learn a new way of talking, or may need a special device to help with talking. The patient’s doctor will consult with several kinds of doctors who can help determine the best treatment. Trained medical staff can also help the patient recover from treatment and adjust to new ways of eating and talking. Surgery to remove the supraglottis (supraglottic laryngectomy) or the entire larynx (laryngectomy). Radiation therapy may be given after surgery. A clinical trial of several small doses of radiation per day (hyperfractionated radiation therapy). A clinical trial of chemoprevention therapy to prevent a second cancer in the mouth, throat, windpipe, nose, or oesophagus. Surgery to remove part of the larynx (hemilaryngectomy) or total laryngectomy. A clinical trial of several smaller doses of radiation per day (hyperfractionated radiation therapy). Surgery to remove the cancer with or without radiation therapy. Radiation therapy. Surgery to remove the larynx (laryngectomy) may be needed if the cancer does not shrink after radiation. A clinical trial of chemotherapy followed by radiation therapy or chemotherapy combined with radiation therapy. Surgery to remove the larynx (laryngectomy) may be needed if the cancer does not shrink after chemotherapy and radiation. Clinical trials of chemotherapy, the use of drugs to make the cancer cells more sensitive to radiation (radiosensitizers), or new forms of radiation. Chemoprevention therapy to prevent a second cancer in the mouth, throat, windpipe, nose, or oesophagus. Surgery to remove the larynx (total laryngectomy), some of the tissue around it, the thyroid gland while preserving the parathyroid glands located near the thyroid, and the lymph nodes in the neck. Surgery is usually followed by radiation therapy. Radiation therapy if a patient cannot have surgery. Surgery to remove the larynx (total laryngectomy) followed by radiation therapy. Total laryngectomy followed by radiation therapy. Total laryngectomy, removal of the thyroid gland, and removal of some of the tissue around the larynx and the lymph nodes in the neck. Surgery is usually followed by radiation therapy. Radiation therapy if a patient cannot have surgery. Clinical trials are testing new ways of giving radiation therapy and the use of radiosensitizers. A clinical trial of chemotherapy and hyperfractionated radiation therapy given at the same time. Cancer of the lip and oral cavity is a disease in which cancer cells are found in the tissues of the lip or mouth. The oral cavity includes the front two thirds of the tongue, the upper and lower gums (the gingiva), the lining of the inside of the cheeks and lips (the buccal mucosa), the bottom (floor) of the mouth under the tongue, the bony top of the mouth (the hard palate), and the small area behind the wisdom teeth (the retromolar trigone). Cancers of the head and neck are most often found in people who are over the age of 45. Cancer of the lip is more common in men than in women, and is more likely to develop in people with light-coloured skin who have been in the sun a lot. Cancer of the oral cavity is more common in people who chew tobacco or smoke pipes. A doctor should be seen if a person finds a lump in the lip, mouth, or gums, finds a sore in the mouth that doesn’t heal, or has bleeding or pain in the mouth. Another sign of a cancer of the mouth or gums is when dentures no longer fit well. Often lip and oral cavity cancers are found by dentists when examining the teeth. If there are symptoms, a doctor will examine the mouth using a mirror and lights. The doctor may order x-rays of the mouth. If tissue that is not normal is found, the doctor will need to cut out a small piece and look at it under the microscope to see if there are any cancer cells. This is called a biopsy. The patient will be given a substance to take feeling away from the area for a short time (a local anaesthetic) so no pain is felt. The doctor will also feel the throat for lumps. The chance of recovery (prognosis) depends on where the cancer is in the lip or mouth, whether the cancer is just in the lip or mouth or has spread to other tissues (the stage), and the patient’s general state of health. The cancer is no more than 2 centimetres (about 1 inch) and has not spread to lymph nodes in the area (lymph nodes are small bean-shaped structures that are found throughout the body; they produce and store infection-fighting cells). The cancer is more than 2 centimetres, but less than 4 centimetres (less than 2 inches), and has not spread to lymph nodes in the area. The cancer is more than 4 centimetres. The cancer is any size but has spread to only one lymph node on the same side of the neck as the cancer. The lymph node that contains cancer measures no more than 3 centimetres (just over one inch). The cancer has spread to tissues around the lip and oral cavity. The lymph nodes in the area may or may not contain cancer. The cancer is any size and has spread to more than one lymph node on the same side of the neck as the cancer, to lymph nodes on one or both sides of the neck, or to any lymph node that measures more than 6 centimetres (over 2 inches). Recurrent disease means that the cancer has come back (recurred) after it has been treated. It may come back in the lip and oral cavity or in another part of the body. Radiation therapy uses high-energy x-rays to kill cancer cells and shrink tumours. Radiation may come from a machine outside the body (external radiation therapy) or from putting materials that produce radiation (radioisotopes) through thin plastic tubes or needles in the area where the cancer cells are found (internal radiation therapy). If smoking is stopped before radiation therapy is started, the patient has a better chance of surviving longer. Treatment depends on where the cancer is in the lip or mouth. Surgery followed by radiation therapy to the neck. Radiation therapy to the mouth and the neck. Surgery to remove part of the jawbone. Radiation therapy followed (if needed) by surgery. External and/or internal radiation therapy. Surgery followed by internal or external radiation therapy. If the cancer is in the upper gums or the top bony part of the mouth (hard palate), treatment will probably be surgery followed by radiation therapy. Treatment depends on where the cancer is in the lip or mouth. In addition to the treatments listed below, a patient will probably have radiation therapy to the neck with or without surgery to remove lymph nodes in the neck (lymph node dissection). Surgery to remove the cancer plus internal or external radiation therapy. A clinical trial of a new radiation therapy technique (superfractionated). External beam with or without internal radiation therapy. Surgery to remove the cancer and the tissue around it. Surgery to remove the cancer and lymph nodes in the neck. Part of the jawbone may also be removed if necessary. External beam therapy with or without internal radiation therapy. A clinical trial of fractionated (smaller doses) radiation therapy. If the cancer is in the lower gums (gingiva), treatment will probably be radiation therapy given before or after surgery to remove the cancer. For all stage III lip and oral cavity cancers, clinical trials are testing chemotherapy combined with radiation therapy. A clinical trial of chemotherapy combined with radiation therapy. Surgery to remove the tongue and the voicebox (larynx) below it followed by radiation therapy. Surgery to remove the cancer followed by radiation therapy. Treatment depends on the type of treatment the patient had before. If radiation therapy was given, the patient may have surgery when the cancer comes back. If surgery was used, the patient may have more surgery, radiation therapy, or both. Patients may want to consider taking part in a clinical trial of new chemotherapy drugs, chemotherapy plus additional radiation therapy, or hyperthermia. 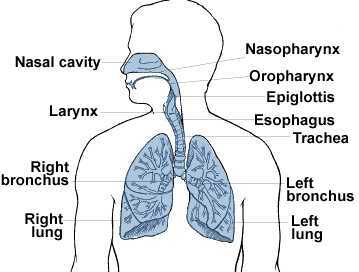 Cancer of the oropharynx is a disease in which cancer cells are found in the tissues of the oropharynx. The oropharynx is the middle part of the throat (also called the pharynx). The pharynx is a hollow tube about 5 inches long that starts behind the nose and goes down to the neck to become part of the oesophagus (tube that goes to the stomach). Air and food pass through the pharynx on the way to the windpipe (trachea) or the oesophagus. 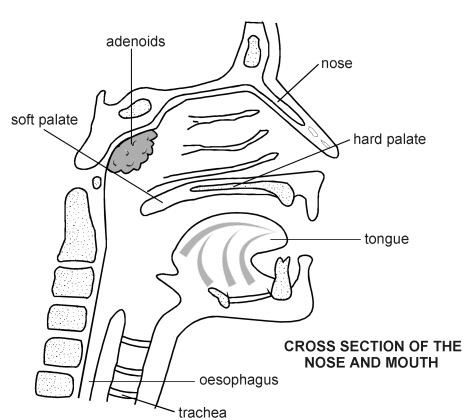 The oropharynx includes the soft palate (the back of the mouth), the base of the tongue, and the tonsils. The chance of recovery (prognosis) depends on where the cancer is in the throat, whether the cancer is just in the throat or has spread to other tissues (the stage), and the patient’s general state of health. After the treatment, a doctor should be seen regularly because there is a chance of having a second cancer in the head or neck region. The cancer has spread to tissues around the oropharynx. The lymph nodes in the area may or may not contain cancer. Surgery (taking out the cancer). Hyperthermia (warming the body to kill cancer cells) is being tested in clinical trials. Radiation therapy uses high-energy x-rays to kill cancer cells and shrink tumours. Radiation may come from a machine outside the body (external radiation therapy) or from putting materials that produce radiation (radioisotopes) through thin plastic tubes in the area where the cancer cells are found (internal radiation therapy). External radiation to the thyroid or the pituitary gland may change the way the thyroid gland works. The doctor may wish to test the thyroid gland before and after therapy to make sure it is working properly. Giving drugs with the radiation therapy to make the cancer cells more sensitive to radiation (radiosensitization) is being tested in clinical trials. If smoking is stopped before radiation therapy is started, there is a better chance of surviving longer. People with oropharyngeal cancer have a higher risk of getting other cancers in the head and neck area. Clinical trials of chemoprevention therapy are testing whether certain drugs can prevent second cancers from developing in the mouth, throat, windpipe, nose, or oesophagus (the tube that connects the throat to the stomach). A clinical trial of radiation therapy combined with chemotherapy. Radiation therapy. Clinical trials are testing new ways of giving radiation therapy. A clinical trial of radiation therapy given with chemotherapy or with drugs to make the cancer cells more sensitive to radiation therapy (radiosensitizers). A clinical trial of hyperthermia plus radiation therapy. People who smoke or otherwise use tobacco are at risk of developing tumours of the throat. Excessive alcohol use also increases risk, and smoking and alcohol use together constitute an extreme risk for the development of throat cancers. However, this doesn't mean that only patients who use tobacco and alcohol are at risk of developing throat cancer. Most cancers of the throat develop in adults older than 50, and men are 10 times more likely than women to develop throat cancers. 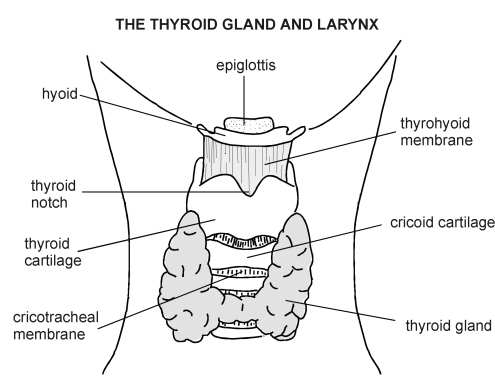 An examination of the neck and throat may show cancers of the throat. The sputum may appear bloody. A lump may appear on the outside of the neck. A laryngoscopy, which is examination by use of a tube with a small lighted camera (laryngoscope), allows the physician to look into the mouth and down the throat to see the tumour. A neck or cranial CT scan or cranial MRI may show throat cancer. These tests will also help determine if the cancer has spread to lymph nodes in the neck. Biopsy and analysis of tissues that appear abnormal may confirm the presence of a cancerous tumour. Treatment is aimed at destruction of the cancer and prevention of spread of the cancer to other parts of the body. When the tumour is small, either surgery or radiation therapy alone can be used to eliminate the tumour. When the tumour is larger or has spread to lymph nodes in the neck, combination radiation and chemotherapy is often used to preserve the voice box and is successful in most cases. Surgical removal of the tumour, including all or part of the vocal cords (laryngectomy) may be necessary in some cases. If a laryngectomy is required, a surgical prosthesis (artificial vocal cords) may be implanted, voice aids may be used, or speech therapy may be recommended to teach alternative methods of speaking. Many patients also need swallowing therapy after treatment to help them adjust to the changes in their throat. Throat cancers can be cured in 90% of patients if detected early. If the cancer has spread to surrounding tissues or lymph nodes in the neck 50-60% of patients can be cured. If the cancer has spread (metastasized) to parts of the body outside the head and neck, the cancer is not curable and treatment is aimed at prolonging quality of life. After treatment patients generally need therapy to help with speech and swallowing. A small percentage of patients (5%) will not be able to swallow and will need to be fed through a feeding tube.